Bar 13 is well known among locals and visitors alike as a lounge, a club and an oasis from your everyday. Sit down among the rooftop palms or lay low in the James Bond style martini lounge. 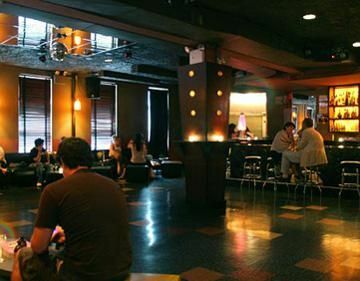 Sip a bit before you shake your troubles away on one of our two dance floors. Internationally known DJs spin techno and house for an intimate dance experience all but disappeared from downtown. Just off the historic Union Square, turn the corner and weekly parties, drink specials and hip hop classics beckon. Stop in after-work for our infamous two-for-one drink specials and kick back on retro-fitted loungers as you unwind after a long day. Or make it your destination for late night partying as you twist and dance on our spacious dance floor. Once home of New York’s infamous Shout! parties Bar13′s first floor is the perfect place to hatch a plot, meet a conspirator, or just sit back and sip one of our famous cocktails. Bar 13′s spacious second floor comes fully equipped with it’s own fabously stocked bar, huge dance floor, killer sound systems pushed to the limit by Internationaly known DJ’s spinning the latest in House and minimal techno. A perfect destination for those looking for a uniquely international dance experience without the plane ticket to Ibiza. Check out the Calendar to see who’s playing from where this weekend. Slip away from the press of the crowd and take in the fresh air in stlye on Bar13′s spacious Roof Deck. Whether it’s your respite from the ill house and techno beats pulsing up from the speakers downstairs or it’s your destination for BBQ and beer on a Sunday, Bar13′s Roof Deck provides the release that accompanies a bit of skyline in Manhattan. Need another beer but don’t want to finish your cigarette? Monday to Saturday 5 pm. - 4 am. ; Sunday 7 pm. - 2 am.